The manor house is a timber framed building built in the 1500s and 1600s and is now split into 3 smaller houses - its a terraced house but not like the ones elsewhere on this site. 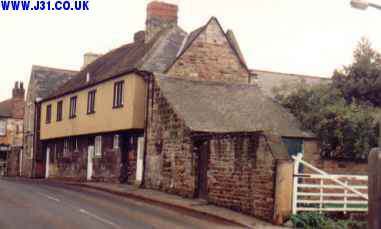 The white gate to the right of the manor house is the entrance to Manor Farm. The house is also referred to as Justice Bradshaws house as it reputedly housed Judge John Bradshaw, one of the Judges who condemned Charles I to death as part of Oliver Cromwell's struggle to establish Parliament as the primary source of power in the English Civil war (1649). 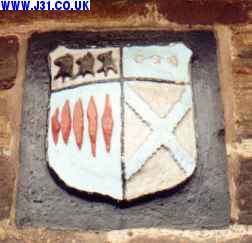 The crest below bears the coats of arm of the Bosvile and Hardwick families from when one Godfrey Bosvile married Jane Hardwick in the 1500s. The Bosvile's also appear in the Harthill with Woodall records at this time and are listed as descendants of William the Conqueror's right hand man William de Warrenne (see the Harthill pages).